"In a bid to help its individual retailer clients compete with large cross-category online marketplaces for a prime piece of the holiday shopping pie, GSI Commerce Inc. rounded up more than 30 of the retailers on its e-commerce platform for a co-operative e-mail marketing program. 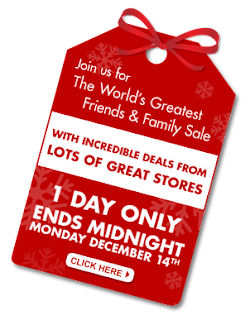 Discounts and deals in GSI’s “World’s Greatest Friends & Family program," which started Sunday December 13 and ran through December 14, were promoted by each retailer to its customers via e-mail. The e-mails directed recipients to a special landing page on the retailer’s site that showed offers from all of the participating retailers. 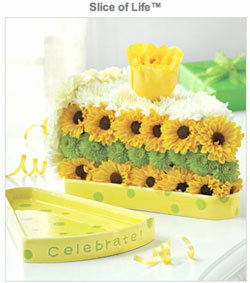 The offers also were posted at www.greatestgifts.com." Here's my personal selection of e-commerce / social commerce moments from this year's LeWeb conference worth checking out, pulled-up straight from the Ustream feed of the event! 3. Here's a way too short roundtable, with low-interest questions and answers, on "How has the real-time web changed your e-commerce business? ", with Zappos (USA), Vente Privée (FR), Otto (DE). Too bad, the topic was well worth exploring fo real. 4. And here's a little bonus, Gary V's intervention, about "crushing it" and giving a crap about your customers, before the conference's closing remarks. Always hard-hitting and hilarious. Enjoy! This 1-year old German luxury fashion label has launched a special business: it's online, with limited collections, and by invitation only. - has sold about 4,000 items, average price of a sweater is €450, or about $675, shipping not included. I sent him a request... Will I make the cut? And can you? You have asked for access to VONROSEN. Thank you for your interest. Our customers rely on a high standard of exclusivity. In the interest of our existing customer base, we are only able to grant access to a limited number of enquirers. Unfortunately, we are not acquainted personally. However, you have us interested by your professional background and the information that we have found about you. We believe that you fit VONROSEN. VONROSEN brings you the best quality and timeless-urban designs. The VONROSEN-signet is individually engraved with your monogram. As a fashion label from Berlin, we produce exclusively in Italy and Germany. Also, you will never encounter any sales or discounts at VONROSEN. For all orders, including gifts and/or gift certificate purchases, we receive before Dec. 31, we offer you an extended money back guarantee (send back by Jan. 14., 2010). With code XXXXXXXX you can now log on at vonrosen.com. eBay with the coolness: interactive USA map of all Black Friday transactions ! eBay announced plans to open "pop-up" boutiques in 12 cities across the USA in an effort to service holiday shopping. Its first ephemeral store popped up on November 20, in a 5,500-square foot Manhattan location, and will close its doors on November 29. Fashion Vault is open to all eBay members and offers free US shipping. As usual, sales events last for two to three days only, and quantities are limited. Currently on sale: DKNY. Thanksgiving / Black Friday: US online retail picking up? eBay targeting $500m GMS by mobile users this year! That's a lot. And they're launching a new app called 'Deals Today'. Complete with price comparison, real-time inventory in stores near you, and consumer reviews straight from the stores' websites. It's Milo.com. Commerce Search: a search engine for your e-commerce website, courtesy of Google -finally! Google has just released Commerce Search, their search product for e-commerce websites. Usage cost is based on the number of products/items (SKUs) in your data feed and the number of search queries entered on your site each year. I'm looking for e-commerce sites that have switched and are testing it out. If it is your case, drop me a note! Storenvy.com, the social store community, is live and it's awesome. "On one side, Storenvy is a series of online stores run by independent sellers. "The little guys." Stores are fully customizable, with a feature-rich store admin panel, and completely FREE. On the other side, Storenvy is a network of shoppers who can shop across all of those stores at once, interacting with each other by watching what notes and ratings they leave on products and stores throughout the site. It's like following your friends and style icons on a shopping spree, watching what they pick up and what they actually buy." Well, it turns out Amazon will shell out $1.2b instead of the anticipated $928b to purchase Zappos, according to today's official press release. Also, GSI Commerce Inc., the blueprint for PIXmania's e/merchant business I helped build, purchased US-based Retail Convergence, owner of Smartbargains.com and Ruelala.com, a 1,5 year old closed-community shopping website... for a whopping $350m. Official news release is available here. GSI Commerce now has private sales capabilities to round out its complete array of e-commerce services (customer acquisition and online marketing, storefront design, order fulfillment, customer support, technology and infrastructure, fraud prevention... you know the drill). A very interesting interview of the CEO of one of the fastest growing e-commerce companies in the US, based on the private sale model born in France, during the Shop.org annual summit which ran from September 21-23, 2009 in Las Vegas. 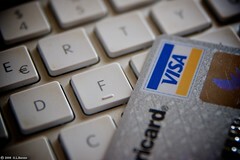 Here's a very nice article on average e-commerce conversion rates in the UK on blogstorm. - shopping cart abandonment stands at 50.1% in the UK compared to 65.61% in the US. A lot of insightful figures, from Coremetrics. Is woot.com's traffic the new Big Mac Index? "Woot’s ability to predict a financial rebound should not be dismissed and that trend is going up." -Read John Biggs' treatise here. Forrester pegged total online retail sales at $156.1 billion last year and projected growth to $229.1 billion, or 8% of total retail sales, by 2013. But fewer than a third of online consumers purchase package goods online today. Check out the SevenSnap app! "In another testament to the notion that Facebook is quietly turning into the internet on top of the Internet, online flower retailer 1-800-Flowers.com has launched an e-commerce store inside its Facebook Page." Once again, 1-800-Flowers leads the way in this type of ventures. - See what your friends think! "At eBags.com, about 1,700 unique visitors view videos each day and the retailer distributes its videos liberally across a wide variety of marketing channels, including e-mail campaigns, affiliate programs and on various social networks such as Facebook, Twitter and MySpace. Videos from eBags.com posted on YouTube since last fall have been watched by almost 19,000 unique visitors." One cool feature is the 'BUY NOW' button in the video player control panel, which enables viewers to browse product thumbnails from the featured product to help jumpstart the shopping process. The video center and player are provided by LiveClicker. The whole story from Internet Retailer is here. And the eBags.com video section is here. 1-800-Flowers has embedded its e-commerce widget into its Facebook Fan Page, and goes down in history by claiming the first retail transaction within Facebook. 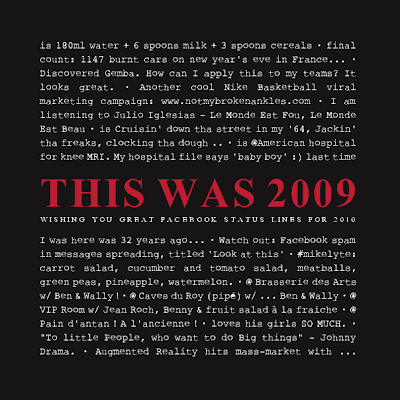 At 11:50 am EST on July 8, 2009, it sold a “Slice of Life” for $34.99. The whole story from the GetElastic blog here. 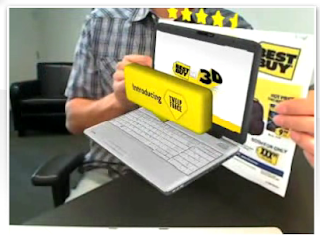 Augmented Reality Video Social Shopping! Zugara, a California-based interactive marketing agency, has just released a new product called the "Webcam Social Shopper". It's an online shopping application, which couples the features of Augmented Reality and Motion Capture. The Webcam Social Shopper app allows to seemingly hold articles of clothing up in front of yourself, while it tracks your movements so you can interact with the site's content when standing several feet away from your computer's controls. And it's Facebook Connect enabled, so you can share pictures of yourself wearing the reality-augmented clothing with your friends. Optaros has just published a free ebook on the 5 social media integration trends that they believe will have an impact on e-commerce. According to a July 09 study by Eurobrief, e-commerce will save the economy in France: it is still growing, it favors exportations and the creation of jobs. Hereunder a few interesting figures from the study. 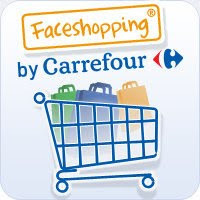 - E-commerce sales in France grew 25% vs. 0.2% for retail stores sales. - Average order size was 92 euros (but 87 euros in Q4 2008). - 69% of online users are shoppers: about 22 million people. That's 4 times more than in 2002. - An e-commerce website is born every 45 minutes: 48,500 total. That's 5 times more than in 2004. - 20% of sales are exported outside of France vs. 9,2% for retail stores. - E-commerce represents 80,000 jobs in France (25,000 direct and 55,000 indirect). A 15% growth year over year. 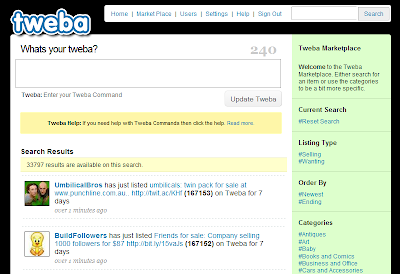 Tweba (formerly Tweebay) aims to bring the power of Craigslist and eBay to the swap meet-like community of Twitter, allowing users to sell and buy goods as they stream in real time. You can sign-up/log-in to the service using your Twitter or Facebook account. Indeed, Tweba makes extensive use of the Twitter API... and of its user interface design. The US copycat of French private sales powerhouse venteprivee.com has just signed a term sheet to raise an extra $40m, valuating the company at $400m (Source: Silicon Alley Insider). Gilt Groupe announced that it had $25m revenue in 2008, should have about $150m in 2009, and projected over $500m revenue for 2010. The company is said to be cash-positive for three months now. The private sales model is booming in major markets, benefiting from the economic downturn where consumers are looking for deals more than ever and where brands need to get rid of their bigger than ever excess inventory faster than ever. Brands4friends from Germany is having a similar stellar year, reviewing its target revenue for 2009 from €75m to €85m. Free music streaming application Spotify has revealed its aim to file for an IPO in the long term. Spotify has gained widespread UK media attention and is reported to have more than 500,000 users in the UK alone, but its revenues were as little as GBP82,000 in May 2009. Spotify is a direct competitor of Deezer, which offers an online streaming service, vs. Spotify's app which has to be installed on the user's computer to stream music. Spotify's revenue is based on a freemium model: free streaming with audio and visual ads embedded in the app, or paid monthly service with no ads. 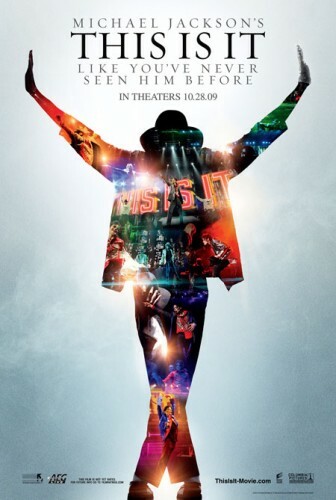 14 Michael Jackson LPs in Amazon.com's Top 15 music sellers; all sold out. SnapTell, maker of the iPhone and Android app of the same name, has been acquired by Amazon to become part of its A9 line-up. - and the ability to purchase straight from the phone. If you own an iPhone, you can try it for yourself HERE. A little more user-friendly than the ShopSavvy app where you actually have to snap a picture of the barcode of the product to get info on it. Interview of Jay Shaffer of PowerReviews, at last year's Internet Retailer conference, on how social commerce can help retailers sell more and better. Amazon will return to TV advertising... with User Generated creative! User Generated TV advertising, round 2: After Doritos with its Superbowl ad, Amazon has just launched an ad contest, calling on its customers to produce the creative. The brief is wide open, go nuts! Dell’s Twitter presence is responsible for more than USD3m worth of sales, says the company. According to Dell's blog, USD2m of this is the result of offers advertised on DellOutlet, a Twitter feed where the company promotes discounted products. The rest is from customers entering Dell’s website via Twitter links and spending money in departments other than the outlet store. 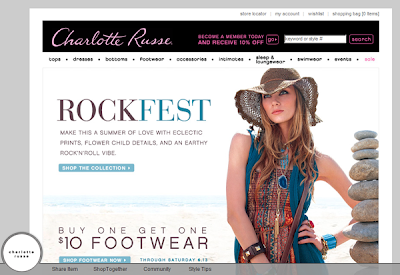 US junior clothing retailer Charlotte Russe just added ShopTogether from DecisionStep on their online store. ShopTogether is a hosted application for retailers that lets customers interact in real-time while surfing e-commerce websites. 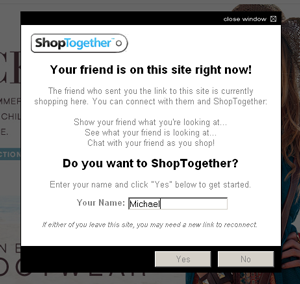 ShopTogether is actually a toolbar that is displayed at the bottom of the site (à la Facebook), from which shoppers can invite their friends to browse/shop with them through Facebook, Twitter, MySpace, email or instant messaging. 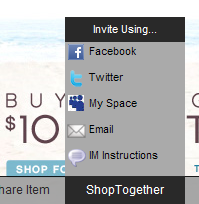 Once they accept the invitation, ShopTogether connects two or more friends for a joint shopping session. Shoppers can chat, view products, share favorites and ideas, helping shoppers making better buying decisions, thanks to the advice they get from their firends, just like in "real-life" shopping. Great integration of social services into the shopping experience. 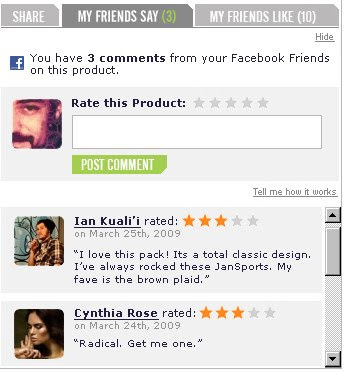 A one-up to the FluidSocial product I reviewed a while ago, which integrated Facebook components into Jansport's website. Ignorant e-commerce founders do it better? "I have been talking to a number of e-commerce startups recently who share a few things in common. They understand the basics of product and pricing and how to manage their supplier relationships; they are competent but not stellar on back-end and customer service. Where they shine is precisely where you would expect them to be weak: they are entirely ignorant of, and refuse to assume any knowledge of, what method will work in terms of attracting customers. They will continuously spend small amounts of money across channels and simply measure, measure, measure (or correlate, correlate, correlate). They throw data at the problem. " 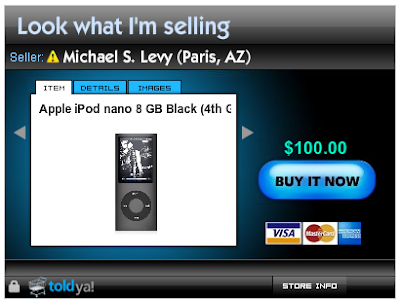 Told'ya helps you build and display a storefront widget in about 2 minutes on your Facebook, Blog, MySpace... and populate it with stuff you would like to sell. Payments are made via Paypal and Told'ya gets a $0.99 cent fee per transaction. IAB has just released its Social Media advertising best practices. facilitate greater adoption of the medium by defining creative components, data usage, consumer control, and privacy guidelines and by providing social advertising examples." Click here to download the "Social Advertising Best Practices" PDF. 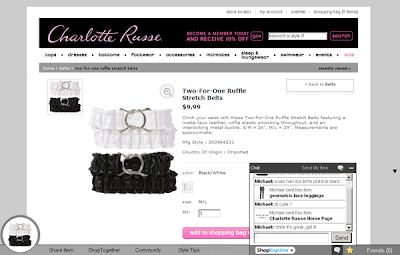 Banners as standalone shopping widgets: really shop in display ads! Here's a link to cool demo of a campaign launched in the US by 1800flowers, of a rich display ad embedding a fully functional e-commerce storefront. You can browse bouquets, search, view product details, add your selection to the basket, checkout and pay without leaving the website you are on, all within a Flash expand layer. How's that for interactive direct advertising? Yesterday Google debuted Rich Snippets, a feature that enables webmasters to build on the "snippet" of content that appears for their sites in organic search results. What's displayed in Google's search results is data about people and reviews/ratings, see screenshot embedded below. Another sign of Google preventing traffic from reaching ecommerce websites and shopping engines by using content it crawls: true, this is currently made possible if the webmasters 'set it up' to be displayed, but for Internet users, why go visit the targeted page if the content you need is displayed straight in the engine's search results? Amazon announced Thursday that it is closing three distribution centers and will cut/transfer the 210 employees. Silverdock produces video for online retailers, and cheap too, starting at $100 a piece. Here's their cool take on how to showcase clothing. Ain't that great? "Noca, a startup founded by ex-Visa employees, is attempting to virtually eliminate transaction fees by bypassing the credit card companies altogether with its own online payment service. Since $5 billion goes towards online transaction fees every year in the United States alone, and since online vendors have particularly slim profit margins, the company thinks that the near elimination of transaction fees would be a huge boon for online vendors. Concurrently, Noca seeks to provide consumers with a more rewarding and more secure purchasing experience, thereby making its service appealing to both actors involved in a transaction." - From Techcrunch. Zero processing fees, zero start-up costs, zero recurring costs. ShopSavvy is a shopping assistant developed for Google’s Android mobile phone platform and was T-Mobile’s featured application for their US launch of the G1 in October of 2008. Users can scan the bar code of any product using their phone’s built-in camera. ShopSavvy will then search for the best prices online and through the inventories of nearby, local stores using the phone’s built-in GPS. ShopSavvy won Google’s Android Developer Challenge and is available in Google’s Market. The US Lost Boys Interactive Group agency IconNicholson deployed a pretty cool multichannel retail event back in 2007, called the Social Retailing™ concept, for fashion designer Nanette Lepore, to demonstrate how young shoppers could move from online to mobile, interacting through text messaging, instant messaging and email for a unique shopping experience. Official press release from IconNicholson here. New MINI Cabrio Augmented Reality from Michael S. Levy on Vimeo. Application possibilities in-store and online are endless... Any ideas? A must-see with great animation. 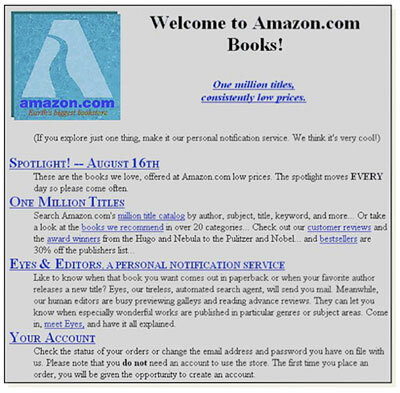 - What if Amazon implemented Facebook Connect? - What if iTunes implemented Facebook Connect? Or how adding social context by populating e-commerce websites with users' Facebook friend graphs will change retail marketing.